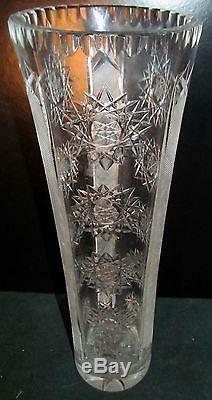 15 TALL CUT AND ETCHED CRYSTAL VASE. 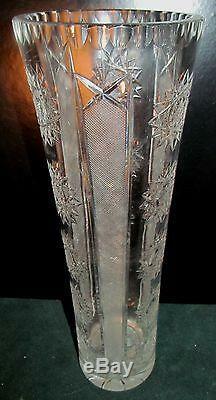 For sale is this wonderfully formed 15 tall cut with three etched panel cylindrical vase. It is in flawless condition and from the spectacular collection of a Western Massachusetts women's estate. Bay Colony Antiques is a dedicated group of New England antique dealers from Springfield, Massachusetts. We have a large inventory of fine antiques ranging from Early American, Federal, Chippendale, Empire, Centennial, Victorian, 20th Century custom mahogany, Art Deco and mid-century modern antique furniture along with decorative arts from across the globe. Our network of contacts and associates reaches across the United States. If you would like to find about any number of our services including appraisals and restoration, please ask us about our website for more information. We accept all major credit cards and are delighted to answer any questions that you may have or provide services you may need. Bay Colony Antiques carefully examines each and every item that we offer for sale. Any noteworthy flaw on any product that we offer that comes to our attention is disclosed. Please understand we deal in a very high volume of goods. Due to delicate nature of antique furniture & decorative art each piece is subject to reasonable wear and tear. We cant describe items to minutia. We simply dont sell goods that have major issues. We have expert woodworkers and re-finishers on staff to service any piece of furniture we offer. We represent all merchandise in absolute good faith and to the very best of our ability. We have a zero tolerance policy for non-paying buyers. Any offer we accept is a binding sale and subject to the conditions herein. Bay Colony Antiques delivers within a 175 mile range of zip code 01105 for a low cost flat rate. We specialize in servicing New York City. And we do it all free of any labor charges! This and our volume shippers discount creates a substantial lower cost for you. They are not furniture movers who bring the items into your home. We can get you special services in certain cases but you are responsible for telling us you require them and the extra cost of these services. If you instruct our shippers to provide services beyond curbside deliveries. We are responsible for any additional services and charged for these services. Again the process is all designed to protect your investment & an option offered for your protection. We dont like to send nice people off with things tied to roof racks. We are not a storage facility. We are happy to hold your items for a reasonable pre-agreed upon period. The item "15 CUT WITH ETCHED PANEL CYLINDRICAL LEADED CRYSTAL VASE" is in sale since Wednesday, May 20, 2015. This item is in the category "Antiques\Decorative Arts\Glass\Vases". The seller is "baycolonyantiques" and is located in Springfield, Massachusetts. This item can be shipped to United States.